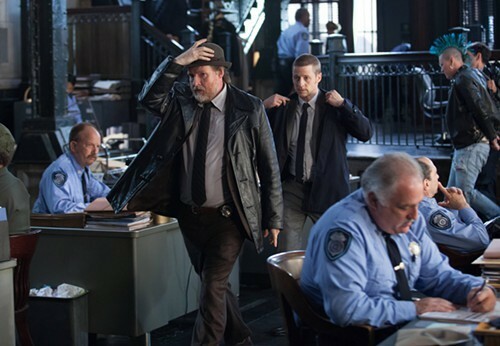 Without a Batman, the cops (Donal Logue, Ben McKenzie) are Gotham's "good guys." Are we so averse to the thought of seeing Ben Affleck's lantern jaw under the iconic cowl that we've retconned Batman right out of the story? OK, that's not exactly what's happening on Fox's Gotham, a new series by Bruno Heller (Rome, The Mentalist). But it is a Batman-less existence for the denizens of Gotham, a city where billionaires are gunned down in alleys, the police dance with the devil—er, mob—in the pale moonlight, and innocent children are orphaned. The premiere has one too many winking nods to devotees of the Dark Knight, but it's mostly a fine introduction. We jump right into the well-known origin story before the first commercial break: twelve-year-old Bruce Wayne (David Mazouz) sees his parents shot and killed in what initially appears to be a robbery gone wrong. He is spared and later meets the man who will become one of his partners in crime fighting, Detective James Gordon (Ben McKenzie). Gordon promises Bruce that he will find his parents' killer, but gets a promise in return—that Bruce will "be strong." Then Bruce's guardian, Alfred Pennyworth (Sean Pertwee), shows up and instructs Bruce to mimic his stiff British upper lip before marching him past reporters. Things get a little sloppy from here because the episode is a little too ambitious (or greedy) in setting up Batman's future friends and foes. Sure, a lot of viewers were probably on a bit of an Easter egg hunt, but little sleuthing is required. Instead of leaving us to guess at future Arkham residents, it broadcasts the characters' destinies with bad puns ("Stay frosty") and odd nicknames—why call a guy who isn't short and doesn't waddle "Penguin?" To be fair, we're all still probably wondering if that one guy is going to be That One Guy, but I bet we'll find out before next season. We also meet the rest of the good guys who are mostly cops, most important among them Harvey Bullock (Donal Logue). Bullock isn't the most integral supporting player in the Batman comics, but he's especially effective in the premiere and, let's hope, the series. Logue plays Bullock as morally compromised, with rumpled charm to spare. He also provides some nuance: where most of the other characters fit squarely into one of two camps (good versus evil), Bullock moves between the two worlds. He cuts back alley deals, in part out of cowardice, but also to mete out what little justice can be had. He's the much needed shade of gray in what was mostly a black-and-white episode. He also serves as a hint of what's to come. Because, despite the lines being drawn, the kind of battle that's stirring in Gotham isn't going to be as clear-cut as bad guys versus good guys, especially since the supposed good guys (the police, and not just Harvey Bullock) have been working with the bad guys (the mob). Things are going to go from bad to worse—and we're going to get a different type of guy working outside of the law.